all of the conveniences of home. The floor to ceiling glass walls of the living room and master bedroom provide a spectacular view. The large balcony overlooks the pool and spa and lets you watch the dolphins romp in the morning surf while enjoying your coffee. Master bedroom has double sinks and private jacuzzi with king bed. Guest bedroom has two double beds (new matresses) and adjacent bathroom. Living room overlooking the balcony has queen sofa bed (air inflating mattress) and love seat with 50 in cable tv. Dining room seats 6. Our kitchen has many of the conveniences for vacation living with slow cooker, george foreman grill, lasagna pans, etc. 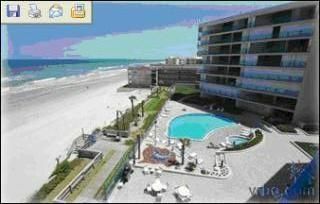 Washer and dryer and all linens are included in the rental as well as beach chairs, boogie boards, etc. in garage. The Ebb Tide is a premier location with luscious grounds, a tennis court, exercise room and sauna.You also are provided with your own garage parking. Come to New Smyrna and make memories for a lifetime. My brothers and I bought the unit because we love the Florida beaches. We live in Ohio and love to bring our families down to New Smyrna Beach. New Smyrna is a thriving, quiet community with unique shops, grocery shopping and restaurants nearby. White sandy beach just steps from the pool deck. Watch the dolphins play in the surf from your balcony. Beautiful and easy to like the surroundings. Kennedy Space Center or Orlando or just enjoy the beach. nearby. Fine dining and shopping abundant.